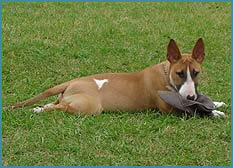 We have been a Bull Terrier family since 1999. Our dogs live with us in northeast Texas and are considered our "kids". They have acreage upon which to run and play and a bed inside the house to sleep in. They are fed a quality diet; seen by a certified veterinarian regularly; receive monthly heartworm preventative; have never had a worm or a flea, and know love and respect for us and each other. 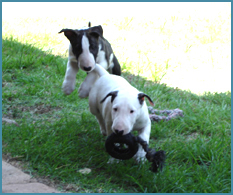 What we strive for is to provide Bull Terriers of quality bloodlines and conformation, friendly demeanors and gentle temperaments. That does not mean we breed the Terrier out of the Bullie; it means our dogs are the best we can hope for in attitude and health. Our sires are chosen for their pedigree and conformation; our girls for their conformation and temperament. We have only one to two litters a year, ensuring our sires and girls are at their peak of health and conditioning when the time comes to "dance." Litters are monitored 24/7. Pups are seen by the veterinarian at five-days old; de-wormed every two weeks; first shots and heartworm preventative at six weeks and a health certificate issued prior to going to their new families. While in our care, pups receive around-the-clock monitoring; indoor and outdoor playtime; basic paper training, and - most importantly - lots of love and attention. Tejas Bullies is a passion; it is not a hobby. 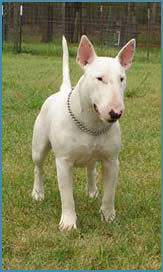 We love the breed, and for those who can commit to be owned by a Bull Terrier, we can provide you with an intelligent, devoted, best friend for life.